It was just over a year ago that I reviewed Douglas Cowley’s excellent strategy game Hoplite ($2.99). I found it to be a superb game, as many did, with tremendous depth and not an ounce of fat on its bones. It’s one of the most efficiently-designed mobile games I’ve ever played. I can’t say for sure if Mucho Party (Free) developer GlobZ was inspired by Hoplite when they made their latest game, Lamp And Vamp ($1.99), but it sure feels like they were. Not in a bad way, mind you. Lamp And Vamp certainly feels familiar, but it’s different enough that it doesn’t feel superfluous. 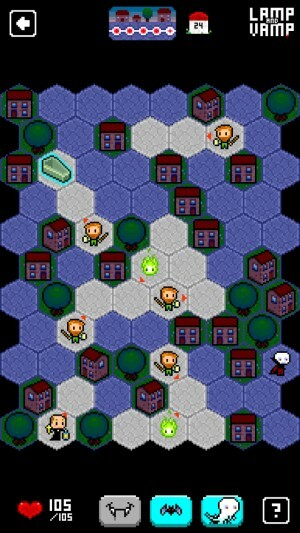 Like Hoplite, you’re trying to make your way across a single board, divided into hexagons, to an exit. In this case, it’s a coffin. All you need to do is survive the gauntlet of enemies that lay in the path. It’s harder than you might think. The story is pretty cute. You play as a vampire who has just purchased a sweet new house on the other side of town. The only problem is that it’s quite a long walk, and just about everything between you and your house will try to kill you if they see you. Well, that’s fair, you are a creature of the night, after all. The stages get bigger and more densely packed with danger as you move on, and survival is very unlikely. If you can stick to the shadows, you’re not defenseless. Provided they haven’t spotted you yet, you’re able to chow down on any adjacent enemy and remove them from play for the rest of the map. You’ll even get a little health replenished for your troubles. In addition to feeding on your enemies, you can also use the standard vampire shape-shifting abilities to help you if you’re in a pinch. Vamp can change into a bat to cross over any space, or turn into mist to harmlessly pass through enemies. Both come at a considerable health cost, so you can only use them sparingly, but it beats getting caught. While you have a health meter, enemies deal such heavy damage that you won’t be long for this world if they see you. There are 20 levels between you and your freshly-minted home, covering four different themes. 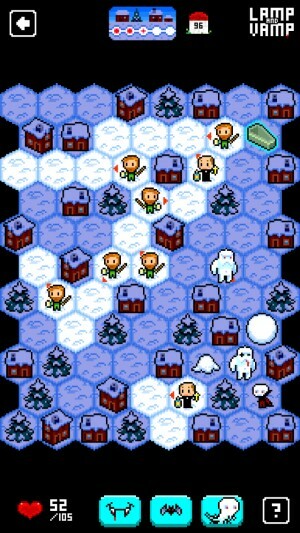 Each theme has its own unique enemies in addition to the basic villagers and priests that you’ll encounter the whole way through. Learning the behavior of each enemy is one of the most important elements in the game. They all have different lines of sight, movement patterns, attack ranges, and abilities, and you need to keep them all sorted if you have any hope of setting foot in your new pad. Your health will likely be slowly whittled down even in a best case scenario, since your powers are sometimes the most efficient means of getting to your coffin without trouble. Your primary means of restoring it is simply clearing a level, but you can also press your luck by trying to feed on enemies. When you clear a stage, you can choose one perk to carry forward. The list includes things like increased healing from coffins or decreased costs on your shape-shifting powers. When you clear a set of five stages, you can choose a special power upgrade like being able to move immediately after turning into mist or being able to feed in one turn instead of two. It’s a great reward for surviving a tough challenge, and it certainly does make you feel a lot stronger. It’s perhaps too much of a confidence booster at times, and the next theme’s new enemies will probably bring you down to earth again in short order. Lamp And Vamp is tough, and small mistakes can have grave consequences. While you can sometimes get out of the enemy’s sight long enough for them to stop looking for you, it gets more and more difficult to do that as the maps increase in size, complexity, and enemy density. Lamp And Vamp isn’t quite as elegantly designed as Hoplite. Given how easily enemies can kill you if you’re spotted, there’s very little incentive to go near them unless you absolutely have to. If you’re lucky enough that the RNG gods make a map with a straight route to the goal, there’s no reason to do anything but go right for it. There’s also very few surprises in store for you beyond new enemies. The modifications to your existing abilities are very useful, but they aren’t typically game-changers. While I’m on that point, the perks are a bit imbalanced in my opinion. The ones that reduce the cost of shape-shifting do so in such small increments that you’re very unlikely to survive long enough for them to start making a real difference, especially compared to more directly valuable perks like increasing your maximum health or how much you recover from your coffin. These are small nitpicks on a very entertaining game, however. The flaws are even more easily forgiven when you consider this game was originally made in a matter of days for a Game Jam. That’s likely also the reason why the graphics and audio aren’t quite as sharp as in GlobZ’s previous game. The graphics have a certain retro-charm to them, and the enemy designs are distinct enough that you’ll never mistake one for another, so it’s all very functional. 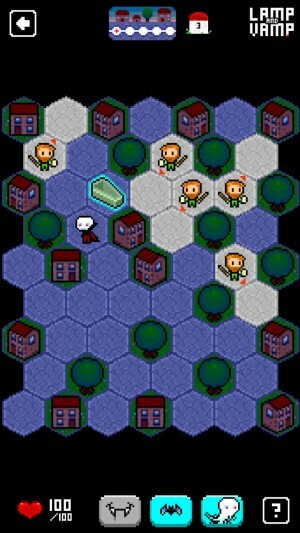 Little arrows clearly indicate which direction enemies will move next, a helpful cue that makes this a slightly more friendly game for beginners than Hoplite. Vamp himself is pretty cute, his head shiny and bulbous like a light bulb. He does a little dance every time he reaches his coffin, which I thought was pretty funny. The music is sparse, generally only playing on the title screen and in cut-scenes, with a little jingle playing when you clear each stage. Mostly, you’re just left to ambient sound effects like howling wolves and so on. The controls are really easy to use, with simple taps handling pretty much everything. There’s also Game Center support, with a leaderboard and a set of hidden achievements to work on. All in all, Lamp And Vamp is a surprisingly fun little strategy game that skillfully manages the tricky task of differentiating itself meaningfully from its obvious inspiration. Its light-hearted take on the concept is welcome and refreshing, and the challenge is stiff enough to keep you coming back for more. Even though it’s strictly turn-based, it has that great quality all good stealth games have: it tempts you to take risk even when there’s a much safer route, just to see if you can get away with it. While there’s a little more flab on its restless bones than Hoplite, it’s easy to love Lamp And Vamp for its sense of humor and its success at achieving that wonderful feeling of vulnerable empowerment.